There is just something nostalgic about making your own homemade vanilla ice cream. The kind where you gather around the kitchen with the kids and everyone has a part in mixing the ingredients together. A hot summer day where everyone anticipates how delicious it is going to be to sink their teeth into creamy, homemade vanilla ice cream. 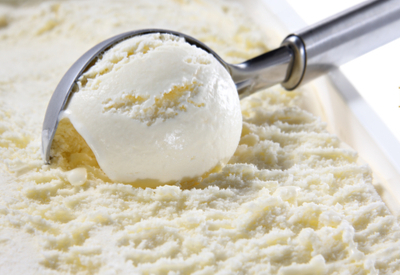 After the ice cream is frozen, scoop it out and serve! I can remember as a child making those memories with my mom. Those were the days when ice cream machines were all the rage! We would mix the ingredients together and then pour them into the bowl of the ice cream machine and let it churn for what seemed like hours. As we waited for the ice cream to freeze we would begin to gather our favorite toppings. Hot fudge, caramel, strawberry topping, and whipped cream were all some of our favorites. 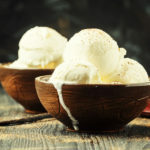 So now that the hot summer months are among us, it is time to once again make homemade vanilla ice cream. 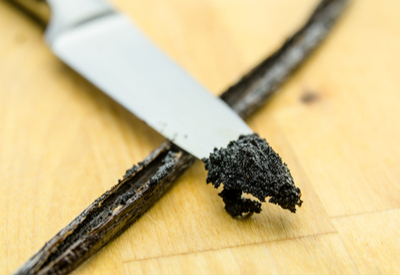 Slice open the vanilla bean and scrape out the inside to get the maximum vanilla flavor! However, this time, it will be without an ice cream machine! The only kitchen tools required are a double boiler and a mixer. Of course, if you have an ice cream machine you can use it, but we no longer have one. So I had to figure out a way to make homemade vanilla ice cream without one! We use a double boiler to make the custard mixture. If you don’t have one, you can use a saucepan and a glass bowl. The crucial part of this recipe is to be sure to constantly whisk the eggs and egg yolks while they are cooking. Otherwise you will end up with a scrambled egg mess! Also be sure to have a cooking thermometer handy. I use a digital thermometer that can be preset to the desired cooking temperature. 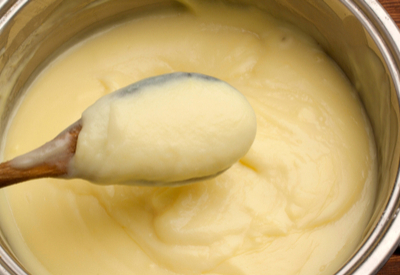 After the custard has cooled, fold in the cream mixture until well incorporated. It will beep once the mixture reaches 160 degrees F and then you know it is time to begin the cooling process. And finally, before the mixture goes into the freezer, be sure to push the plastic wrap down onto the ice cream itself. This will help prevent a layer of ‘skin’ from forming on top. So this summer, slow life down a bit and instead of running to the store for ice cream, make it yourself along with some fantastic memories! No need for an ice cream maker – you can make your own creamy and delicious vanilla ice cream with just a double broiler and mixer! Prepare an ice bath by adding ice and water to a large stainless bowl. The top pot of a double broiler must be able to fit half way down into the ice water. Place water in the bottom of a double broiler, making sure that the top pot does not come in direct contact with the water and place on medium heat. Place the eggs, yolks, sugar, and salt in the top pot of the double broiler. Split the vanilla bean lengthwise and scrape the insides of both sides, placing both the scraped portions in the mixture along with vanilla bean. Heat mixture for approximately 10 minutes, whisking constantly! Keep stirring until the temperature reaches 160 degrees F.
Immediately remove from the heatand place the pot into the ice bath and let cool. In a mixing bowl, combine the heavy cream, 2 tablespoons of sugar and vanilla extract. Beat until frothy and soft peaks form. Remove the cooled custard from the ice bath and remove the vanilla bean. Add in 1/3 of the heavy cream mixture to combine. Repeat until all the cream has been folded into the custard. Place the mixture into a freezer safe container. Place plastic wrap directly on the top layer of the custard. I think you meant double bOiler, not bRoiler?